Being the capital of Thailand, Bangkok is a bustling mix of culture, history, shopping and nightlife. Located in central Thailand, this city borders the Gulf of Thailand with an average of 6.5 million residents. From traditional street food to magnificent boating-scenes and grand architectural landmarks, you can find it all in Bangkok! The city encompasses all-night party districts, never-ending market stalls, ancient temples and a myriad of adventurous outdoor activities. With so much to take in, it’s imperative that a visit here makes up part of any Thailand holiday. For those with a thirst for Thai history, visit Grand Palace, Temple of the Reclining Buddha (Wat Pho), Temple of the Emerald Buddha (Wat Phra Kaew) or Temple of Dawn (Wat Arun). Spend the day in high-end shopping centres where you’ll find bargains-galore or go all out and purchase a suit tailor-made just for you. Alternatively, unwind and indulge in the traditional, inexpensive and high-quality massages by Thai professionals. The peaceful Phraya River runs through the heart of the city and visitors can enjoy a peaceful voyage during the day or an evening dinner cruise. Inspired by Bangkok’s exotic food culture, attend a cooking class where the locals will lead you through the produce markets to purchase ingredients before aiding you in preparing a flavourful, authentic Thai dish – a truly unbeatable culture exchange! Walking and coach tours as well as oases found in the endless parks dotting the city provide all travellers a unique perspective of Bangkok. 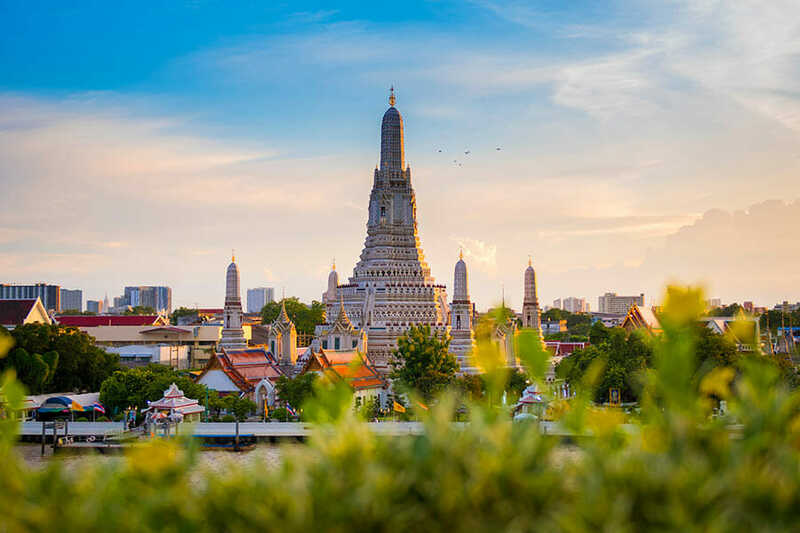 With its beginnings as a small trading post near the mouth of the Choa Phraya River, in just 200 years Bangkok has grown outwards and upwards into a striking Asian metropolis, attracting over 11 million visitors per year – almost as many as Paris and London. Some believe it’s the gleaming temples or floating markets that make Bangkok such a desirable holiday destination, but it’s time to visit Bangkok in all its rich, dynamic glory and find out for yourself!